GIVE yourself a treat over the Chinese New Year holidays and read the latest MR MIDNIGHT books. 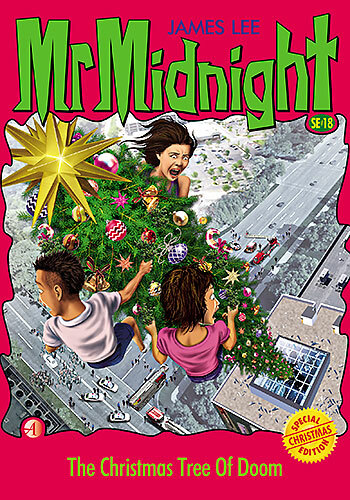 There are two books — the LUNAR NEW YEAR SPECIAL EDITION, SE#22 and MR MIDNIGHT #97. Join millions from all over Asia who love the James Lee books. And don’t forget to buy the books missing from your Mr Midnight and Mr Mystery collections. SCHOOLGIRL Wang Luxi loves Lunar New Year — greeting all her cousins, opening red packets, and eating all the festive treats! But this year a strange supernatural power invades her life. And it’s worse than any ghost she could ever imagine. WHO STOLE LUXI’S LUCK? Can she and her friends Tami and Lian Wen reverse a diabolical spell? 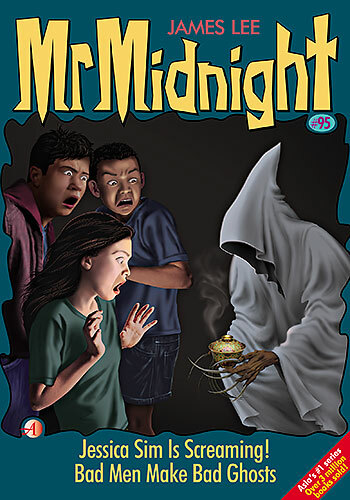 Make sure you have a frighteningly good New Year with the luckiest book in town — from Mr Midnight! STORY #1: Wong Chen Cheng’s school vacation on Australia’s Gold Coast becomes a living nightmare! Sinister snakes, weird trees that grew on the South Pole millions of years ago — and monster insects. Will he and his friends survive the MOUNTAIN OF MADNESS? STORY #2: Ghost Getter Lynnette Foong visits an abandoned garage where a haunted bus has been hidden for years. It’s not just any bus, but THE BUS THAT NEVER CAME BACK. MERRY CHRISTMAS and a HAPPY NEW YEAR! 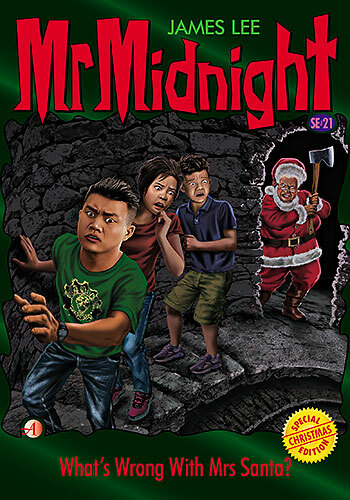 James Lee presents a new Mr Midnight for the holiday season. And remember to get any missing books in your JAMES LEE collection! What’s Wrong With Mrs Santa? WHAT could be more fun than Christmas? But wait — something evil lurks in Kong Chern Lee’s favorite shopping mall. There’s terror amid the tinsel! It’s Santa’s wife — something is wrong with her, and unless Chern Lee and his friends can stop her, Christmas will be a disaster. What hideous horrors has she got up her sleeve? What are the deadly secrets hiding in Santa’s castle? We dare you to find out WHAT’S WRONG WITH MRS SANTA? Only Mr Midnight delivers more holiday horrors on every page! TWINKLETOES is fun, inspirational, educational and simply magical! THE Morrison players are sent to a boot camp to prepare for the fast approaching National Championship. During their gruelling training, they have a surprise encounter that shows them the fleeting nature of success and the importance of holding on to good relationships. And when 13-year-old Jasmine opens a Facebook account for the first time, she gets more than she bargained for. Far from being a way to keep up with her friends, it turns out to be a dangerous experience. Fortunately she has a teacher on her side to help her navigate the tricky world of social media. TRICK OR TREAT? 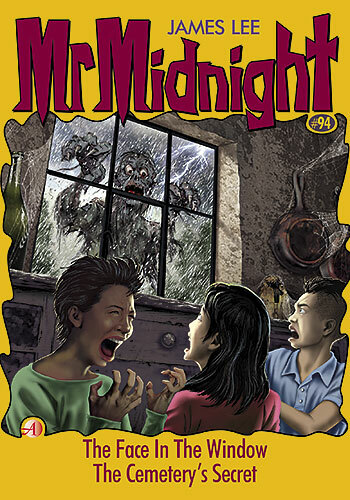 James Lee, Asia’s top children’s author, has a special treat this HALLOWEEN season — MR MIDNIGHT HALLOWEEN SPECIAL EDITION SE#20. Exams are over and it’s time to chill with Mr Midnight and Mr Mystery books! IS IT TRUE — do the dead come out of their graves on Halloween? Do ghouls and ghosts walk the earth in search of victims? Royston Goh and his friends decide to find out. But when they explore the local park, they discover ghostly Vikings are invading their city. Find out what happens when THE HALLOWEEN VIKINGS INVADE! It’s Mr Midnight’s latest tale of terror. 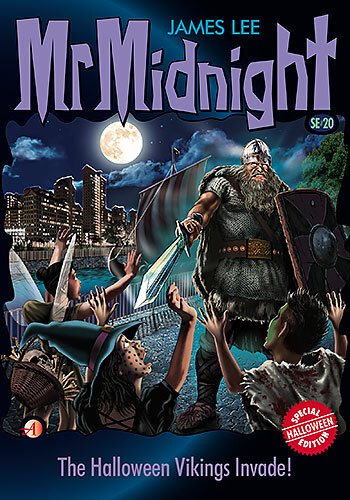 MR MIDNIGHT must be one of the longest-running book series in the world. This is the 96th book and readers are spoilt for choice. 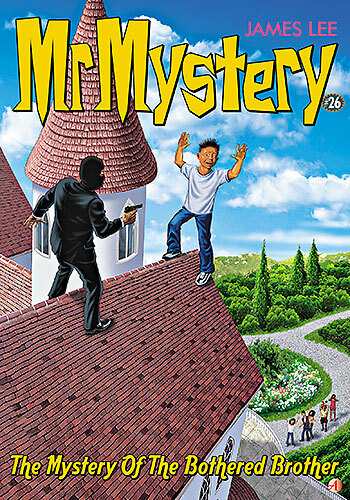 James Lee also pens another Mr Mystery – the 26th! 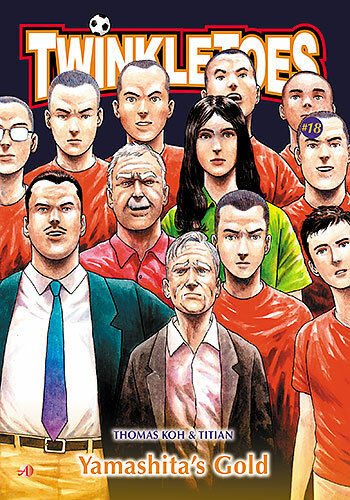 Reading Mr Midnight and Mr Mystery adds a bit of spice to your school holidays! 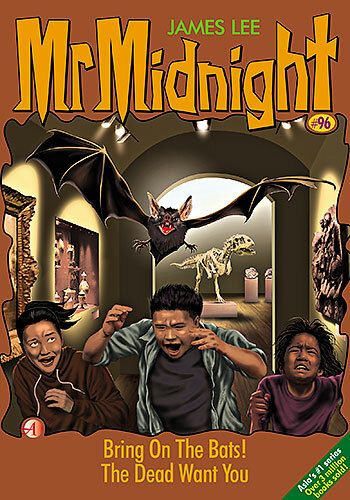 STORY #1: Grace, Siti, and Ripley go to the museum where the rare vampire bats from South America are on display. But are they all really dead? We dare you to read what happens when we BRING ON THE BATS! STORY #2: Christopher Choo is tough. But he’s no match for a fierce electrical storm where evil voices speak through the lightning. THE DEAD WANT YOU, they tell him. Before he can escape, he’s taken prisoner by forces beyond his control! WHY does Arthur See’s brother want to kill him? Does he want the billionaire’s money? But how could a dead man, killed in a boating accident twenty years ago, still be alive? When billionaire Arthur See hires Soh & Co to protect him, Alvin and his team start searching for a dead man. But when The Snake and Fat Johnny Tann join in the chase, the bullets start flying. Did Geoffrey See really die? What was the truth behind his accident? Can Alvin save Arthur See’s life? 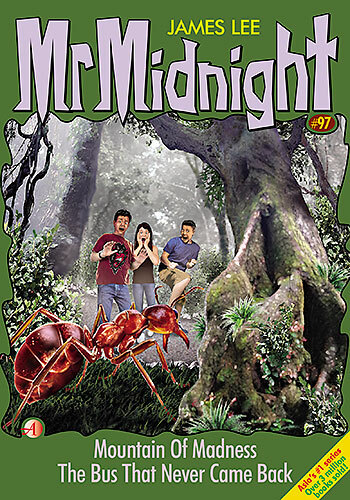 GIVE yourself a treat over the Chinese New Year holidays and read the latest MR MIDNIGHT books. 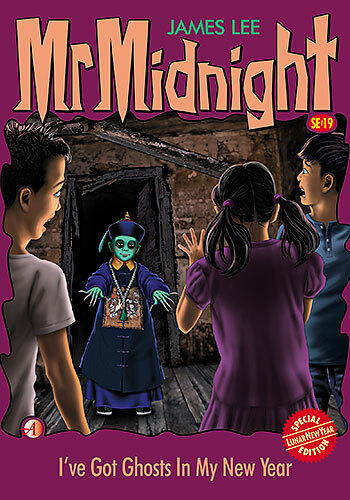 There are two books — the LUNAR NEW YEAR SPECIAL EDITION, SE#19 and MR MIDNIGHT #95. Join millions from all over Asia who love the James Lee books. 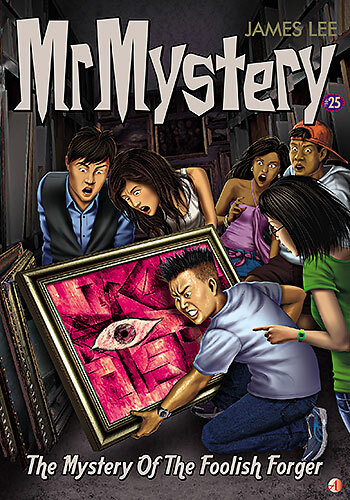 And don’t forget to buy the books missing from your Mr Midnight and Mr Mystery collections. IT’S a special spooky treat from Mr Midnight — and the luckiest book in town! Ryan Cheong and his friends are expecting lots of red packets. Instead they get ghostly spirits that breathe life into corpses — weird spirits that build new bodies with bones and rotten flesh. Bodies with red eyes, sharp claws, green skin — and that’s just the beginning. Join Ryan and you too will scream: I’VE GOT GHOSTS IN MY NEW YEAR! STORY #1: JESSICA SIM IS SCREAMING! But her friends Toby and Dec Ron don’t believe she can see ghosts. Until a famous Chinese ghost kidnaps them all for her slaves. By then, it won’t be just Jessica who’s screaming — you will be too! STORY #2: Have you ever been stalked by an evil ghost? Have you ever found a skull with a brick in its mouth? Join Xin Yi and her friends when they discover why BAD MEN MAKE BAD GHOSTS. MERRY CHRISTMAS and a Happy New Year! These new Mr Midnight and Mr Mystery books are specially for the holiday season. The year-end holidays are the best time to add those missing titles that will complete your JAMES LEE collection! WHEN Michelle Mun and her friends visit their local shopping mall, they can’t believe their eyes. A real living Christmas tree — all the way from Finland — stands in the atrium. At first they think it’s awesome. Then they discover it’s THE CHRISTMAS TREE OF DOOM — full of evil spirits and trolls from the darkest Finnish forest. And when they become trapped in the tree with a mysterious boy, the horrors don’t stop. Don’t miss the creepy Christmas thrills! WHO was shot dead on a cruise ship? Why wasn’t he one of the passengers? Who killed him, and why was the murderer disguised as Santa Claus? 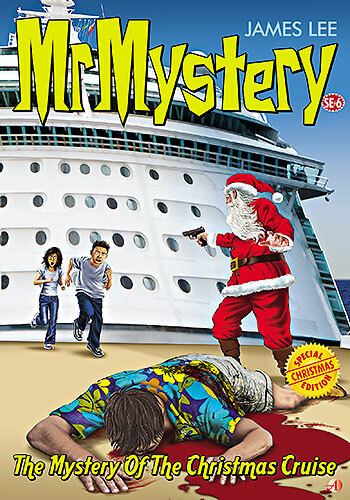 When Alvin and his team of investigators sail off on a Christmas cruise, murder is the last thing they expected. But soon a tangled web of death and deception turns Soh & Co into the killer’s new targets. Why was a Mafia gangster really on board? What was his deadly secret? Will his brutal killer stop Alvin from solving the case? ARE you worried evil spirits lurk in your home? Russell Lee reveals the many religious rituals used to “cleanse” homes. Also read about “The Cat Man”, the saviour of thousands of cats. The cats repay their hero in the most unusual way. Must-read stories include “Nama Saya Iblis”, Golden Oldies, A Talking Head, Midnight Matchmaker, Taken, Blue Jeans Dream. THE holidays are coming! Time to chill out — grab the latest Mr Midnight and Mr Mystery books. Join the millions of readers from all over Asia who love James Lee. Take advantage of the promotions to buy the copies that are missing from your Mr Midnight and Mr Mystery collections. STORY #1: Daliya Osman and her friends go wandering in a small village in the jungle. When a storm breaks out, they take cover in a spooky derelict house. It appears deserted — until Daliya sees THE FACE IN THE WINDOW. STORY #2: Schoolboy Wilbur Pang believes he will see ghosts in an old abandoned cemetery. But what he finds is the creepiest horror of his life. Join Wilbur and discover THE CEMETERY’S SECRET. WHO was shot in the art gallery? What was he doing there at midnight? Was the murderer paid to kill him to protect a deadly secret? Alvin’s team of investigators is hired to find a missing man. But what seems a simple case soon turns into a double mystery. Don’t miss Soh & Co’s baffling new journey into the art of murder! Who stole the famous Picasso painting? Why is the art gallery owner lying? What is the secret that unlocks the case? ONLY MR MYSTERY KNOWS! DOLLY SINHA DAVENPORT arrived in Singapore as a bride in the 1960s. Settling into her new life and a new home, she was encouraged to pursue her passion in floral design. Being a botanist, she took to the art like a duck to water. She was taught Sogetsu and Ikebana but true to her feisty character, Dolly developed her own pragmatic style — due in no small part to the myriad influences surrounding her in her adoptive country. In this book, Dolly expresses herself through floral arrangements. Her story is intricately tied to Singapore’s — the years after World War II, the fight for independence, Singapore’s merger with Malaysia and its subsequent separation. She was transfixed as she witnessed kampongs give way to a metropolis. True to the spirit of her endeavour, Dolly uses only flowers found in Singapore. The designs reflect a multiracial Singapore. She also draws inspiration from high-rise dwellings, the bygone kampongs and Singapore’s almost 200-year botanical heritage. 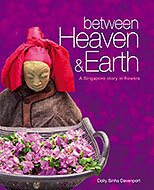 This book is a Singapore story, told in flowers. And the backdrop is the Singapore story — from the days of Singapore’s founder, Sir Stamford Raffles, to the architect of modern Singapore, Mr Lee Kuan Yew; and from Raffles’ functional botanic gardens to Mr Lee’s vision of “a Garden City”, now evolved into the idea of “a City in a Garden”. IS THE blood moon a sign of the end of the world? Russell Lee investigates. And read about Japanese urban legends that tell of vengeful spirits that slice, dice and slash! Plus, the “Japan’s Sacred Regalia” trilogy reaches a climax. Must-read stories include Arrival At Kallang Airport, “Tian Mi Mi”, Brunei Dollars, The Curse Of Kohinoor, Nasi Lemak Special, Angel Of Hope. 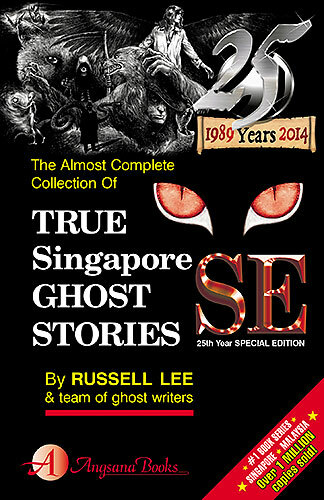 IN THIS special True Singapore Ghost Stories 25th Year Special Edition, Russell Lee recalls the stories that have charmed and entertained generations for a quarter of a century. 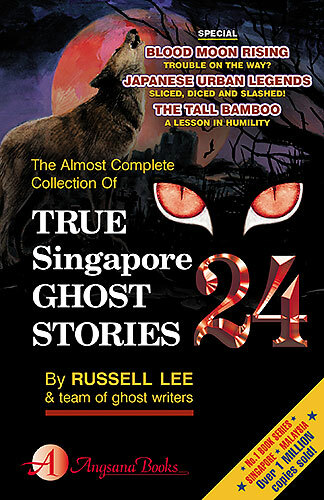 This book contains nothing less than the supernatural heritage of Singapore and Malaysia. 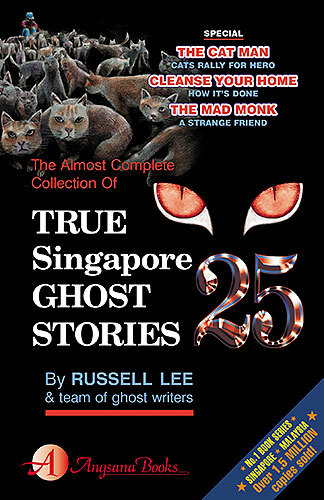 Read your favourite stories in one special book, and celebrate this milestone with Russell Lee. Well-loved TRUE stories include Teacher’s Pet, The Poor Rich Man, The Third Eye, A-Li-Shan De Gu Niang, Japanese Girl From Hell, The Rich Poor Man, The Si Lang Keng, Tour Packages For Sale and Raphael. 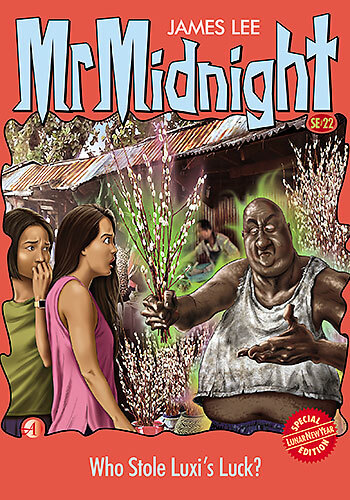 ASIA’s top children’s author James Lee has won the inaugural “Australian Arts in Asia Awards” for his Mr Midnight and Mr Mystery series. See footage of the presentation and speech at the awards ceremony. 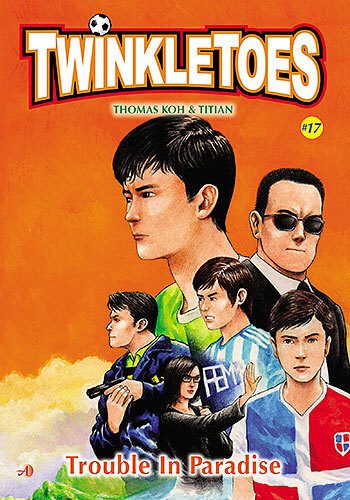 © 2019 Flame Of The Forest Publishing Pte Ltd. All rights reserved.